Planning a tasty, sustaining diet for a backpack trip is a daunting task for many new backpackers (and some long-timers too)! 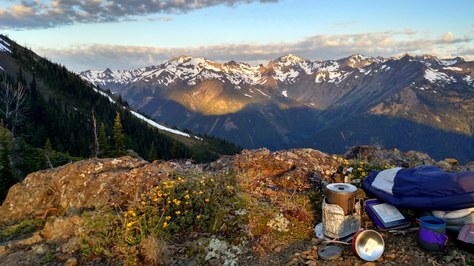 Read on to find tips for choosing foods that pack a lot of energy per unit of weight to make your next backcountry meal more tasty and lightweight. Few subjects cause so much hesitation on the part of new backpackers as trail food! How much do I need? What kinds should I pack? The questions are endless, and luckily we have a few tips to help you stay happy and well fed on the trail! At The Mountaineers, our volunteer leaders want to help you avoid unhappy bellies on the trail. Read on for my tips below, or come to this class on June 12 at Gibson Kiwanis Hall in Issaquah to learn more, including tips for making your own food and lots of great samples to taste. For a short trip you can live on power bars, ramen, and a calorie deficit and come out pleased with a little weight loss. But on trips over 3-4 days, if you don’t have enough food or can’t bear to eat what you brought, the resulting lack of ‘fuel’ can mean a steady deterioration in your energy and a high likelihood of a serious “bonk”, potentially spoiling a life-list trip. As a backpacker with twenty years of experience, I want to share my secrets with you from two decades of trial and error. You wouldn’t set off on a long drive across the desert without planning for how to fuel up along the way. Likewise, backpackers need to map out their fuel needs for the trip they’re planning, in the form of calories from food, if they want a successful trip. Most new backpackers are amazed at the calories they use backpacking compared to their ‘regular life’, especially while having such a good time doing it! Based on research on metabolic rates for different activities, an average sized person with a 30-40 pound pack on a moderately strenuous trip will burn between 2000 and 3500 calories per day. Certain conditions (more rugged terrain, high elevations, cold temperatures) can demand even more energy. But individuals vary greatly in the calories they need to stay energized on their backpack trips. So task #1 in backpack menu planning is to understand your own calorie needs. Start in the target range, at the lower end if you’re smaller, carrying a lighter pack or planning an easier itinerary; at the higher end if your weight with pack is greater or your trip plan is more demanding. Calculate the calories you’ve packed, and how much you bring back uneaten. Over time you will gain a good idea of your own body’s calorie demands for particular types of trips. No brainer? Probably. But often neglected. The biggest challenge facing backpackers is how to deliver our daily energy needs in a daily menu we look forward to eating while keeping our packs light. Foods vary widely in their “calorie density” – that is, the calories (the basic unit of food energy) delivered by a food item per unit of weight. For example, a fresh crisp apple carries around 240 calories per pound, while a bag of macadamia nuts carries almost 3300 calories per pound. Since we have a certain calorie requirement to fuel each trip we’re planning, and the pounds in our packs will greatly impact our enjoyment of the trip, it’s critical for your trail menu to pack the highest possible calories per pound. So how do you do this? By checking out the calorie density of your favorite trail foods and putting them together into a total daily menu that has the highest possible overall calories per pound. Start by making a list of all the items that you would consider packing for a day’s menu: breakfast, lunch, snacks, dinner. Then work out the approximate ”calorie density’ of each food item – the calories per gram – by looking up the calories and serving size for each food item from package labels or helpful websites like Nutritionix (or from this handy lookup table that I created with lots of common trail foods!). The total calories per serving divided by the total weight of the serving gives you the calorie density for that item. If an item has a calorie density of less than 3 calories per gram (~1800 calories per pound), see if you can substitute for something else you like with a higher calorie density, or increase the amount of other items in the daily menu that have a calorie density of 4.5 or higher (>2000 calories per pound). There are some simple ways to identify high calorie-density foods, primary among them being a higher percentage of fat and a low water content. Fat Content: Fats are particularly important in a lightweight, high calorie diet because they are very calorie-dense - they pack 9 calories per gram, whereas carbs and protein provide only 4. So aim for 30-50% of your food weight to be in fats (aim higher the more important it is to keep your pack weight to a minimum). Luckily some very tasty foods like nuts, nut butter, cheese and flavored olive oils have a high percentage of fat. Water Content: Water weighs 2.2 pounds per liter, and contributes nothing to the energy content of your food. So, while you want to carry enough water to stay hydrated on your trip, you DON’T want to carry it hidden in your food. There’s an easy solution to minimize water content: instead of fresh fruits, veggies and meats, look for freeze-dried or dehydrated versions that can be eaten as-is or rehydrated at camp. These components can be dehydrated at home or purchased from many sources. For lookup tables of a wide range of trail foods, energy bars and common dehydrated meals, reference our calorie density lookup tables. Of course, we cannot live on fat alone (as yummy as that might sound!). You’ll want a balanced trail menu, with carbs for quicker energy, fat for sustained energy, and protein to maintain muscle….and most of all, you want a mix of foods that you look forward to eating! Every viable trail-food menu will include some low and some high calorie density items. Experiment with trading some of your lower-density for higher-density foods, and look for dehydrated or freeze dried alternatives where available, to get the average calorie density of your entire daily menu up as high as you can. Many a great plan to reduce pack weight has been thwarted by poor execution: you get to the night before your trip, and in a big rush you just throw things into a stuff sack, putting in some extras “just in case”. Whether it’s trail food or trail gear, the best way to manage your pack weight down, while assuring you’ll have what you need, is to make a checklist and weigh everything as it goes in. I find that the best way to determine a realistic serving of a given food is to transfer a certain amount of that food into a zip-loc bag (perhaps starting with the serving size from the label), set it out on your kitchen counter, and scrutinize it against what you think you might reasonably consume in a meal. If your meal will include multiple items, put the servings of each of the foods in the meal out at the same time. Some people eat as much as 1.5-2 times the quantity of food on a vigorous backpack as they would at home, but your eye is the best guide. Add more if it looks insufficient, or take some out if it looks like too much. Measure and record the volume (cups, teaspoons, ½ package, whatever) and weight per a serving (your new realistic serving) using an inexpensive food scale – grams work well for this purpose. Here’s an example of a simple menu spreadsheet where you can build your daily menu, check and balance the calorie densities, record your reasonably daily serving size, and then use it as a checklist to pack for a particular trip. Check out the example on the second tab of the menu spreadsheet. In this example, I’ll be out for 3 days and 2 nights so I need 3 sets of lunches and snacks but only 2 breakfasts and 2 dinners. The empty box to the far right of each item is your checklist – mark the box as weigh out each item and put it into the pack. Put everything on your checklist so you don’t forget. You can package up larger volume items (say, macadamias in the plan above) into daily quantities in smaller ziplocs, or weigh out the whole amount in a single bag to pull from throughout the trip. (I always break out daily meal quantities of dehydrated meals into their own smaller zip loc, so that I can rehydrate right in the bag.) Resist the temptation to throw in extras “just in case” – you can certainly add some extra in your meal plan for emergencies, but do this deliberately. If you’re lucky and take care of yourself, backpacking is something you’ll be able to do for a very long time. Use every trip, particularly your early ones, to try out different gear and food combinations. Challenge yourself to see how light you can go and still achieve acceptable energy and comfort while hiking and while in camp. Always consider the terrain, elevation, trip duration and weather report for your route as you make these decisions. Everyone’s food preferences and calorie needs are different! If you find that a certain food item consistently comes back uneaten, it may be something you can do without. Look for new alternatives for your heavier items. Over the years that you travel, your pack will get lighter while your confidence and enjoyment increases. It might seem a bit complicated at first. But as you get started, if you take it step by step with the basic tips described above you’ll find it becomes second nature. Plus you’ll use the same checklist for your future trips, occasionally adding and subtracting food items, so you only need to build it once and save it. A deliberate, thoughtful approach to choosing the food and gear you load into your pack pays off in so many ways, as you find yourself moving lightly along the trail with the energy you need and the gear to succeed on the backpack trip that you’ve been looking forward to. Happy trails, and happy (light!) eating!